A global renewable energy project on the Galapagos Islands -- one of Earth's most fragile and important ecological treasures -- has helped avoid many tanker loads worth of risky diesel fuel imports since 2007, reduced the archipelago's greenhouse gas emissions and preserved critically endangered species. Now, after eight successful years, the project's new operators are pursuing an ambitious expansion that would multiply the benefits of renewable energy for this remote, precious archipelago with a growing appetite for electricity. A performance summary and recommendations for the expansion are contained in a new report by the Global Sustainable Electricity Partnership (GSEP), a not-for-profit association of 11 of the world's foremost electricity firms, which led and financed the $10 million project. The project's three 51-metre-tall wind turbines and two sets of solar panels have supplied, on average, 30% of the electricity consumed on San Cristóbal, the archipelago's second-largest island in size and population, since it went into operation in October 2007. During that time, it has displaced 8.7 million litres (2.3 million gallons) of diesel fuel and avoided 21,000 tonnes of carbon dioxide emissions, the GSEP report states. The achievements have led to awards from Power Engineering Magazine, World Energy Forum, and Energy Globe. The proposed expansion could boost the renewable energy share to 70 per cent, en route to a hoped-for elimination of fossil fuels, the report states. It could also be a template for energy development elsewhere in the Galapagos chain -- where renewable sources now account for 20% of electricity production -- and elsewhere around the world. Says Marco Salao Bravo, Executive President of ELECGALÁPAGOS S.A., the local utility that has accepted full ownership of the project: "Our team shall continue working in the implementation of current and future renewable energy projects to convert the Galapagos into a zero fossil fuels territory." The Galapagos, an archipelago of 19 islands in the Pacific Ocean 1,000 kilometres off the coast of Ecuador, is home to an array of unique, exotic plant and animal species and famed as the site of Charles Darwin's research of the evolution of species by natural selection. Although most islands are uninhabited and protected from development, a few have growing populations, now 30,000 in all (up from 25,000 in 2010, with 33,000 forecast by 2020), economically supported by thriving tourism, which is capped at 200,000 annual visitors. San Cristóbal, site of the provincial capital, is among the busiest islands with a bustling port and airport. For decades, all of San Cristóbal's electricity came from diesel-fuelled generating stations. That began to change in January 2001 when a tanker, the Jessica, struck a reef and spilled about 570,000 litres of diesel oil, threatening the irreplaceable heritage of plants, birds and marine life. A fortuitous mix of wind and currents narrowly averted an environmental catastrophe, but the event launched an international effort to reduce San Cristóbal's dependence on diesel fuel to generate electricity. Centrepiece of the international response: The US $10 million San Cristóbal Wind Project, a public-private partnership between the Government of Ecuador, the UN Development Programme and the GSEP, with member companies American Electric Power and Germany's RWE AG taking a lead role. The funds went into a trust, which created an independent company, Eólica San Cristóbal S.A. - EOLICSA, to own and operate the project. On March 31, EOLICSA transferred ownership and control to the local utility, ELECGALÁPAGOS S.A.
Each of the three turbines, designed to operate at a very low wind speed, has a capacity of 800 kilowatts. Over the first eight years, they have functioned a remarkable 92% of the time, and produced more than 26 million kilowatt-hours of electricity. The project also includes two six-kilowatt solar installations that have generated 136,000 kilowatt-hours of electricity, as well as new transmission lines and advanced control systems that let the renewable and diesel components work together efficiently. The project also boasts several environmental successes. Its license requires it to follow an Environmental Management Plan, a set of measures to protect unique bird populations, in particular the Galapagos petrel, which exists only on the archipelago and is listed as "critically endangered" by the International Union for Conservation of Nature (IUCN). 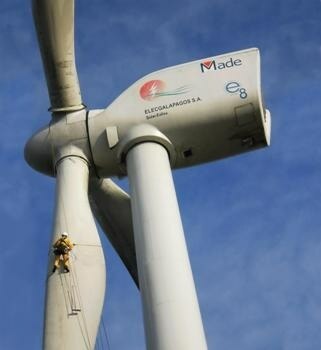 The turbines were erected on a hill known as El Tropezón, an agricultural area distant from petrel nesting sites, and where there is little Galapagos Miconia, an endangered plant. In addition, the first three kilometres of a new 12-kilometre transmission line were buried to avoid interfering with Petrel flights between their nesting grounds and the sea, where they spend daylight hours fishing. Also included is an effort, using poison, to reduce populations of invasive rats and feral cats, which arrived on the islands via visiting ships, and which eat petrel eggs and chicks. Furthermore, machetes are used to remove invasive plants, such as blackberry and guava, which crowd out the miconia and impair the nesting habitat. The results: No petrels are known to have been injured during the eight years of wind turbine operations and nest monitoring reveals the pest controls are working. From 2012 to 2014, hatching success rates increased from 85 to 96%, reproductive success grew from 81 to 100%, and the petrel population appears to be growing. On the financial side, the price charged for electricity is fixed at a relatively low US $0.1282 per kilowatt-hour. As well, depressed global oil prices undermined Ecuador's economy, causing ripples affecting the project. The project is eligible to participate in the Clean Development Mechanism (CDM), created under the Kyoto Protocol climate change treaty. The CDM set up a market for Certified Emission Reduction certificates (CERs), each equivalent to one tonne of carbon dioxide emissions, which can be sold by countries that are below their emission targets to those that exceed them. The project sold 11,000 CERs, for a total of US $110,000, during its first four years, but because of low prices it has not participated in the market since then. ELECGALÁPAGOS forecasts that, despite energy-conservation programs, electricity demand will rise by 60% from now to 2024, on top of a 275% increase realized since 2003. Consumption is spurred by the rising population, a new hospital and hotel, and other factors. A national attempt to reduce the use of fossil fuels through a shift from ovens fuelled by liquefied petroleum gas to electric induction models will add about 1.3 megawatts to annual demand on San Cristóbal. Winds vary widely daily and from season to season, leading to large variations in renewable production. The current low oil price has forced Ecuador's government to reduce spending on all programs. Install batteries to store electricity generated when winds are strong for dispatch when they are low. The project currently has no storage. Adding enough storage capacity to make a significant impact would be expensive, says Luis Vintimilla, General Manager of Eólica San Cristóbal S.A., and precise cost estimates will be included in the upcoming feasibility study. However, he adds, with support commensurate to the international value of the Galapagos, 70% energy from renewable sources is feasible in the intermediate term en route to the ultimate goal of zero fossil fuel use. GSEP has agreed to fund an evaluation, led by German utility RWE, of a phase 2 expansion of the project involving the organization. RWE will assess the feasibility of options to further increase the share of renewables on San Cristobal and to deploy innovative energy solutions such as advanced integrated technology portfolios consisting of wind, solar PV and battery storage.